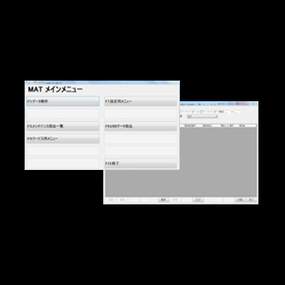 MAT Computer System ｜Opton’s products｜Opton Co., Ltd.
Self Failure-finding, assurance for time-saving production and traceable production data preserved for reliable QC. ●Easy installation as an original equipment to a new machine or optional to an existing machine. ●Electrical failure and disconnection are indicated in symbol. ●Repeatability of all NC axial motion during service are automatically stored as QC data and also for comparison with the initial values, working as good reference to know the right time for regular maintenance. ●The CCD camera installed to the Opton machine can be LAN-connected to MAT and further to Opton Maintenance Dept. to support after-market service of higher quality. ●Error-monitoring can be facilitated by internet directed to the Opton Maintenance Dept. ●The production data can be saved for full-rated or thinned-rated output pieces over long-term production with security by ID facilitated. 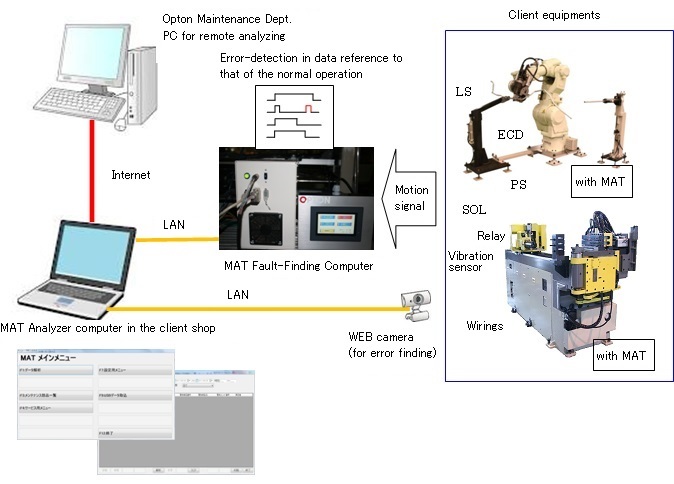 MAT(Maintenance Analyzer Traceable Computer System) is a mini-computer with professional function for saving and analyzing in time-sequence of the self-detected mechanical/electrical faults on the NC machines as well as quality-management data (or the production data containing those of machine operation). Deteriorated machine parts and components affect ill to the function of the machine itself, being resulted to machine errors. Ill-affected machine will eventually tend to cause more production faults, and any anti-error action has been started first only after such machine- or product-error become apparent. This situation used to need more time and efforts to trace back of the machine operational conditions for causation and even more time for repairing action at an extra cost production stop. MAT Fault-Finding Computer performs to reads all signals of speeds and/or torques available from LS, encoders, Pressure sensors, vibration sensors (or deterioration signals of driving mechanism of the machine), solenoid valves and motors, and thus makes it possible to keep the machine operation monitored and recorded in all time. With the MAT fault-finding Compute once installed to the machine, the outcome of abnormal machine motion is alarmed with so-indication. The saved machining data can be reviewed for analysis and maintenance action. The data available as the correct machine operation stands for the master data and is compared to the data available from on-going operation. An alarm appears when the value of electric-reading (current/torque) or ON/OFF timing is found outsides the tolerance of LS, ECD, vibration sensor, the drives. Either installation can be met, as an original equipment to a new machine, or as an after-market equipment for machine grade-up. Error is indicated in a symbol, showing in the indicator the location of a faulty part or wiring in the electrical /control systems. Notice is given for a periodical maintenance needed for mechanical and electrical parts. MAT Fault-Finding Computer mounted on the production machine can be LAN-connected to the MAT Analyzer computer in a remote location. When an error occurs, a few possible causation may be listed of error location, symbol and corresponding description in the drawing. Big help for pin-pointing of error part. Periodical maintenance is urged showing the related mechanical/electrical parts enlisted. Very helpful to save maintenance history and to avoid lazy maintenance. Error-monitoring can be facilitated via internet communication between machine and Opton Maintenance Dept. In collaborated work with CCD camera on the machine, live-communication on the machine condition is made with the computer at Opton Maintenance Dept. Maintenance advice may be advised on line with referring the machine image available on the display. Production data can be saved for full-rated or thinned-rated output pieces over long-term production and the data is accessible at any.. Saved production data is accessible only by ID key. Collected data can be save in external server or HDD.